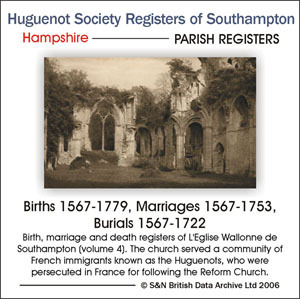 This reproduction on CD-ROM of the Huguenot Society Register of Southampton: Births 1567-1779; Marriages 1567-1753; Burials 1567-1722 comprises a full transcription of the church registers of L'Eglise Wallonne de [the Walloon church of] Southampton (Volume 4). It was originally published in 1890, but retains the original French. This church was used by French Huguenots fleeing religious persecution in France, who settled in Southampton. In addition to births, marriages and burials, there is a list of those who professed their faith and were admitted to 'la Cène' (the Last Supper), plus other information about the affairs of the church. Details of events often include the place of origin in France and there are many references to Guernsey and Jersey. The rather archaic French has odd words and spellings, so caution is needed when seeking assistance from a modern French dictionary. A list of the French abbreviations used is given. There are indexes of names and places. The CD-ROM is bookmarked, fully searchable and may be printed.